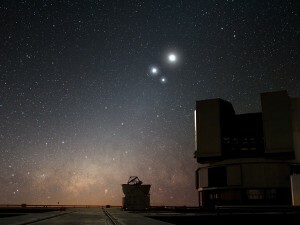 Today’s wallpaper, which shows the moon, Venus, and Jupiter having a conversation above ESO’s Very Large Telescope (VLT) celebrates two things: the observatory’s 50th anniversary and the publication of the book Europe to the Stars. ESO is second only to NASA in its release of images to the public, and in the realm of astrophotography, it dominates in its generosity. I could easily provide a wallpaper image a day just mining ESO’s extensive web collection, but where the fun be in that? You can waste as much time as I can digging through their archives.